Where to Park in Farnham | Curchod & Co. If you do decide to relocate to Farnham for business, then it is likely that you will need to travel further afield for networking events, business lunches or to attend meetings either in London or the surrounding areas. We have included some useful information for you on the main car parks that are located in the town centre. However, this is not an exhaustive list and more information can be accessed via the links which are provided below. 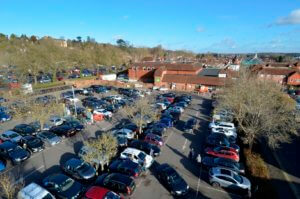 Located opposite the police station on Victoria Road, this car park is ideal for shoppers and visitors to the town centre. In addition, to the spaces below, Central also provides free parking for bikes and motor cycles, along with toilet facilities. The car park entrance is in Dogflud Way off East Street and also offers toilet facilities along with parking for bikes and motor cycles. Blue badge holders can park in any unreserved space for any period of time at no charge. For more information, restrictions, times and charges check out the local Waverly Council website. Parkopedia also enables you to find the cheapest car park available. Simply enter a few details and it will display a map with prices and locations across the town. For more information about Farnham’s residential permit scheme for parking, you can find out everything you need to know, including eligibility over on the local council website. Alternatively, if you need to travel further afield by train – perhaps to London – then Farnham train station also offers 577 spaces with 10 accessible ones for those with restricted mobility.